What is Call bypass and how does it affect Telcos & Country? Central Bureau of Investigation, Nepal Police have ramped up their operation for the illegal VoIP call bypass in Nepal. Recently they arrested two Indian nationals for their involvement in the illegal business. Find the details of VoIP call bypass and the loss for the telcos & Nation. 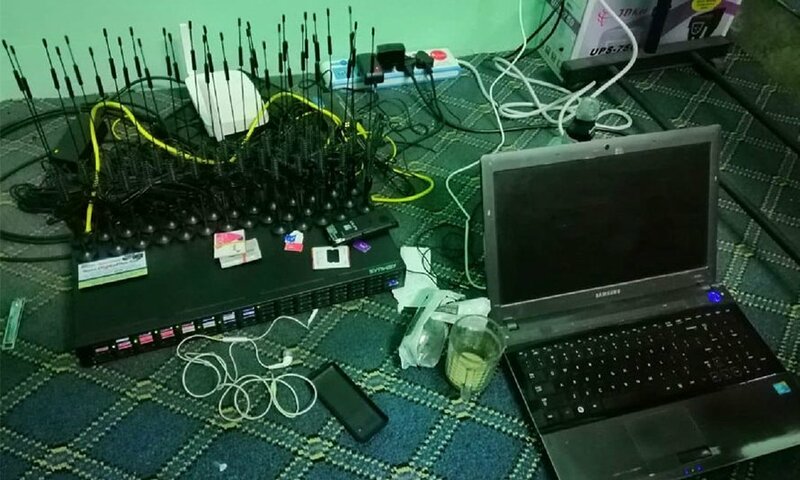 They found them to operate the illegal VoIP call bypass in a rented room at Samakhushi, with the raid performed by CIB’s operation Voice Fox team. CIB officials also found the equipment/device used for the call by-pass. They are 128 port VoIP gateway, 32 antennas, router, Media converter, UPS, recharge cards and SIM cards of NTC, Ncell, Smart. There were 15 SIM cards of Ntc, 10 of Ncell and 11 of Smart Cell. There were also some unused SIM cards, 3 Mobile handsets, and some Indian Passports. They might have used those passports to get the SIM cards. As per investigation, they were using that equipment to bring international calls from China. They brought the equipment from India and also got the technical support from India itself. Prevailing telecom law prevents the use of such VoIP equipment to land calls from abroad. Call bypass is a term for the use of some equipment to divert the international calls from the official gateway of the telcos. They use VoIP (Voice over IP) technology for this sort of bypass. VoIP is a transmission technology for the communication of voice using IP (internet protocol) through internet and packet data networks. First, they make a call landing to their equipment via the Internet and then the calls are transferred to the local number by either using SIM card or local landline. Nowadays most of the VoIP call bypass is made through SIM card for their portability and convenience. Normally the international calls pass through telcos international gateway and they bill as per regular tariff. So the telcos get some share of the international calls landing. But if such calls are bypassed, telcos do not get anything out of it, apart from the local call. The current law terms such call bypass as illegal as it makes a huge loss to the telcos and the government. They bypass calls from their official international gateway, making a loss in their revenue in billions. Similarly, the Government also lose the taxes out of those billion revenues from the telcos. Apart from the revenue loss, Police also suspect those calls to be used for crime. As they could not track those call, it makes the investigation difficult for the Police. How to identify the VoIP bypass call? If you receive a call from abroad and your phone caller ID shows a local number, then it is an illegal VoIP call. Sometimes the call may even show “Private Number” as well. These bypassed international calls are cheaper for the end users abroad but they are a big threat to Nation’s income and security. So, we request you to complain about the local mobile number to the responsible authorities when you find it. Read more for how to complain. “If a person acts intentionally to cause adverse effect damage or cause any other loss or damage to the Telecommunications Line, Telecommunications System or the equipment or any other structure related to such Telecommunications Line or Telecommunications System or induces for such acts or attempts to do such acts such person may be fined with an amount equal to lose or damage as well or punished with imprisonment for a term not exceeding five years or with both punishment according to the degree of crime”. CIB has already caught a lot of individuals, racketteers involved in those illegal VIP call bypassing. Due to the big loss, telcos are helping CIB to track such SIM cards and racketts involved in the VoIP call bypass. We would also like to request the public to help the CIB and telcos to prevent such illegal action.